Almost all modern smart thermostats are wifi enabled for a reason – it makes our lives easier. The smart wifi enabled modern thermostats are not only easy to operate with our smart devices, but they can also learn about our habits, lifestyle and adjust the temperature accordingly. Some pricey versions even come with modern sensors that can detect our presence and movement in the house. This way, these modern thermostats not only offer us convenience but also save us money by reducing energy consumption. How to Compare Between WiFi Thermostats? What Can a Smart Wifi Thermostat Do that Our Traditional Thermostat Can’t Do? 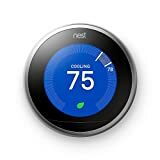 Nest Learning Thermostat is a smart WiFi enabled learning machine that can connect with a range of different smart devices. Other than its amazing smart features, it can significantly reduce your energy bill. 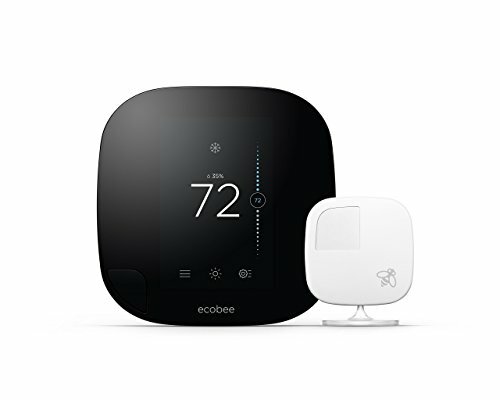 Our next choice is Ecobee3 Smart Wi-Fi Thermostat that is another smart WiFi enabled device that can save up to 23% on your energy bills. It can easily integrate with any smart device and has an ability to auto adjust room temperature according to your lifestyle. 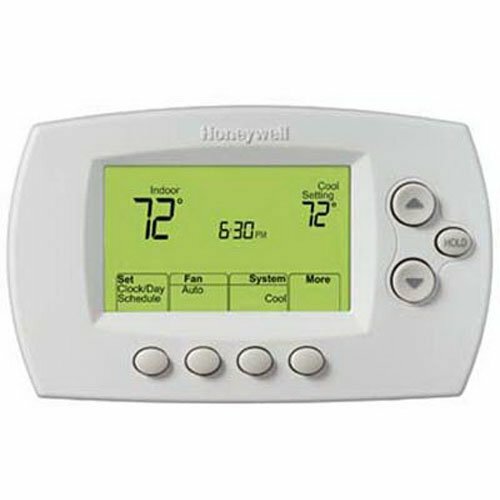 For those who are looking for a budget friendly but quality WiFi thermostat, we have listed Honeywell Smart. This one also helps in saving energy costs by auto adjusting to your daily activities. 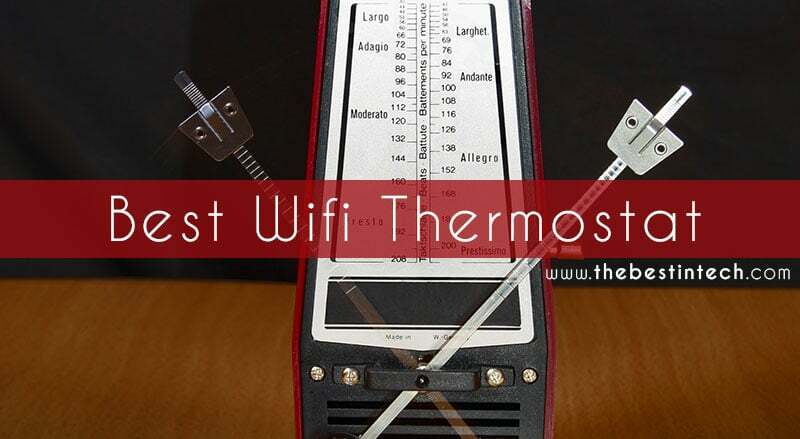 Sensi WiFi thermostat is another quality option for those who are interested in low-cost but good durable thermostats. This one is easy to install, works perfectly with a wide range of smart devices and adjusts the temperature to save energy. 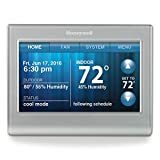 Our last choice is Honeywell WiFi 7 Day Programmable Thermostat, another simple to install, budget friendly, wifi enabled programmable thermostat that offers you great value against its low cost. When it comes to smart high-tech wifi thermostats, Nest is one of the most recognized brands out there. This modern smart thermostat can be easily connected to your smartphone, laptop or any other smart device through wifi. As the name says it all, this is a smart learning high-tech thermostat that can amaze you with its learning ability. The thermostat can learn when you are home and when you are away, your temperature and lifestyle preferences and can adjust accordingly. After first few interactions, you don’t have to do anything as the thermostat will run on its own adjusting temperatures at bed time, morning, and even with changing seasons. This allows you to not only save energy but also efforts and time you spend on manually adjusting thermostats. The WiFi remote control feature allows you to turn your smart device into a remote control. You can easily operate and adjust thermostat using mobile Nest App. You can also access reports like energy history through these apps to learn about how much energy you have saved. The thermostat is also very well designed and attractive with an outlook of stainless steel. It has a feature – Farsight – that detects the presence of a person when someone enters the room and displays the temperature and time. It comes with a lot of smart sensors that include humidity, temperature, ambient light, far-field activity, and near-field activity sensors. But out of all its smart features, it is most known for its energy saving ability. It can save up to 12% on heating bills and 15% on cooling bills. For its ability to save energy, Nest Learning Thermostat is ENERGY STAR certified. This one is another WiFi enabled smart learning device that can adjust temperatures according to your lifestyle habits. The thermostat uses smart remote sensors that help it with advanced motion control around the house. With its high-tech sensors, it can detect if anyone is at home or not, adjusting the temperature automatically when you leave or enter the house. With its advanced remote sensors, you don’t have to install it at the center of the house. It can work perfectly from any corner of the house, locating people if they are in one room, sleeping or moving around. This highly intelligent device also works with Apple’s HomeKit and adjusts the temperature according to daily activities of residents. This helps users reduce their energy bills by 23% annually. It also comes with an open API that allows it to integrate with a wide range of smart devices. You can connect it with any smart device using WiFi. It works with all major home automation apps available on Apple and Android devices including Apple Homekit, Wink, SmartThings, and Amazon Echo. It does not come with a battery but act as a hardwired device which means it is built to last. 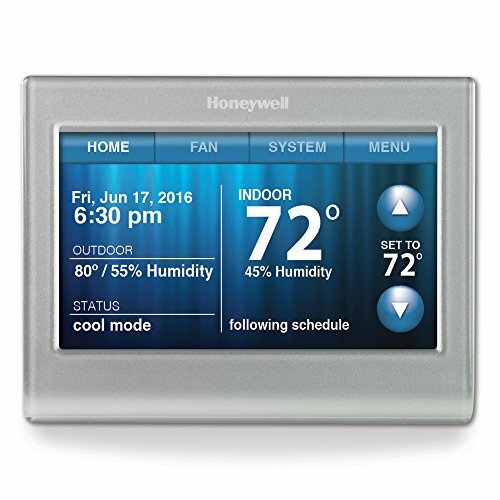 Honeywell is known for its high quality but comparatively affordable smart thermostats. The Honeywell Smart thermostat is a WiFi enabled device that uses Geofencing to adjust the temperature accordingly. This means it tracks your smart phone location to identify if you are at home or away. The thermostat auto adjusts the temperature according to indoor and outdoor temperatures. It can be easily operated through any smart device using Honeywell’s Total Connect Comfort Service. You can also program it for 7 days in advance according to your future needs. The programmable mode allows users to save more in energy costs. It also has a Smart Cues feature that sends important maintenance alerts that can help extend the life of HVAC system. This is also another hard-wired thermostat that does not need batteries so it lasts longer. It also comes with an indoor humidity sensor and comfort control that adjusts automatically. The programmable feature allows you to switch between home and business settings, that makes it a good fit for both home and office use. It also learns your heating and cooling cycle and adjusts according to it. Sensi Smart Thermostat is another WiFi enabled device that is very light on your pocket but works as good as other expensive options. The thermostat is manufactured by Emerson that is known for its low cost but quality thermostats. This is also a good fit for those who want a thermostat that does not need c-wire as this one operates on a pair of AA batteries. You can also use on screen buttons to adjust temperature or program it according to your future needs. The device allows you to go through a wide range of settings to customize temperature cycles. You can set time and assign a temperature to each time slot accordingly. Other than manual settings, the WiFi thermostat is also controllable with a mobile app. The app also provides you details about energy savings, average temperature, and other dashboard details. 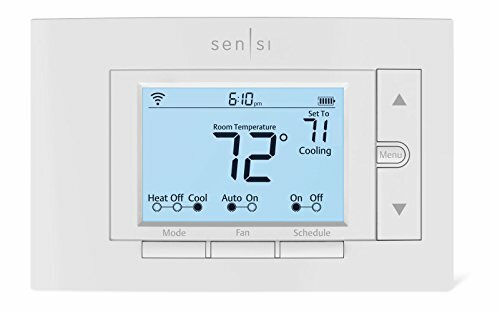 The only difference between the pricier top models and this one is that you have to manually tell the thermostat when to adjust temperatures, but in other expensive smart devices, it auto adjusts by sensing your movements. 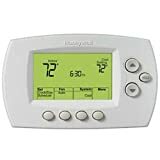 The second thermostat in our list from the same company is not a surprise as Honeywell is known for its wide range of quality thermostats. This is another smart and cost effective version of its modern thermostats that is both wifi enabled and programmable. It can also integrate well with the Z-Wave smart home and home automation platforms, and works with all smart phone devices, both Apple and Android. You can also use a wide array of apps to integrate and control this thermostat. The outlook seems little dated but it allows you to schedule different temperature settings for different time slots seven days in advance. The touch screen interface is very simple to use as you go through the settings very quickly. By using the programmable options and adjusting temperatures according to your habits, you can save a good amount of money on your energy bills. With the options available in the market, most of us often find ourselves confused which one is best for our use. But if you have a clear picture of what you need, you can easily find one that goes well with your lifestyle and habits. Here are few factors that you need to go through to find the best one. According to the latest report published about the residential energy consumption in the United States in 2016, thermostats were responsible for 25% of the total energy consumption. So a smart WiFi thermostat that can be operated remotely or adjust temperatures on its own based on our lifestyle and habits can significantly reduce our utility bills. It is one of the most important factors after the convenience of use. You can significantly drop your energy bill payments if you have a smart thermostat. It is also often an integral part of smart home solutions and if combined with Smart Lights, Solar Panels, and other smart home tech products, it can help reduce more than half of your total energy consumption and your energy bill. On top of that, if you have a smart thermostat installed in your home, it can also increase the price value of your home. Most of the WiFi smart thermostats either come with sensors that can detect your movement or they have programmable features that allow you to set different temperatures for different times of the day. In our list, three of the top 5 thermostats are programmable and two top options are smart. As smart wifi thermostats come with tons of high-tech sensors that can track your movement and take a decision based on that, they are much higher in price if compared to programmable thermostats. Programmable thermostats are low cost, but they require you to provide manual settings for future temperature control, for next few days. With wifi programmable thermostats, you have an option to change settings with a smart phone app or you can manually set the temperature using on screen buttons. When it comes to energy savings, smart wifi thermostats are a better option than programmable wifi thermostats. Programmable thermostats are only better if you lead a robotic lifestyle, otherwise, if you want your thermostat to adjust temperature every time you move outside, or even sleep in a room, while the other rooms are vacant, there is no better alternative of smart wifi thermostats. Some smart wifi enabled thermostats also provides you complete reports of energy consumption and how much you are saving in energy costs. These thermostats come with apps that provide a lot of other details as well on their dashboards. This is probably the biggest reason why growing number of people prefer wifi thermostats over other types – the ease of use they offer. These wifi thermostats allow users to control thermostats settings and temperature using a smart phone, tablets, and even computer using specific apps. You can even control thermostats remotely even if you are not at home using a mobile device. With smart wifi thermostats, you don’t even have to do that anymore. You can only read the reports it generates and let it work on its own. Even though smart wifi thermostats are very easy to deal with once they are installed, but some of these are not very easy to install and configure as some require c-wire to work with HVAC system. Many people have a question if there really is a need to replace their traditional thermostats with the latest wifi smart thermostats, and if they do, what difference it will make. First, there is a demand for this newer version for a reason – because they are good and offers a lot more than our traditional thermostats. Even if the price is an issue, a smart wifi thermostat pays for itself in one or two years by allowing you to save on your energy bills. When you have to adjust the temperature in your home manually, the wifi enabled smart thermostats allow you to program temperature for a week using your mobile device. This limits your interaction with thermostat and saves energy. Other than that, with a smarter high-tech version like Nest Learning thermostat, you don’t even have to do that as it adjusts the temperature on its own based on your lifestyle and daily activities. Overall, wifi enabled thermostats are a better and more modern version of traditional thermostats that makes adjusting the temperature and climate in our homes hassle free. On top of that, they can also save money on energy bills. These thermostats pay for themselves in a couple of years. If you can install these on your own, you can further decrease the cost. In the modern world, where the concept of smart homes is becoming a craze, and more and more people want to control everything around them using their mobile devices, wifi thermostats are now a necessity. With the ease of use, energy saving, remote control features, detailed online reports, and smart auto temperature adjustments, some of these even amaze users with their innovative features.